I ran a kid's Christmas card last week and this was one of the cards they made. It uses the super cute No Peeking stamp set # 126292. 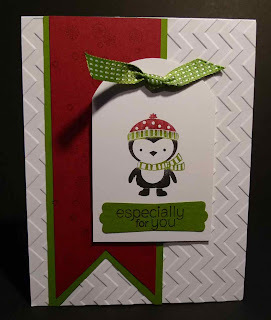 The penguin was colored with Raspberry Ripple, Gumball Green & Basic Black Stampin' Write markers and stamped on Whisper White card stock. The Whisper White card stock was placed through the inside of the 2-1/2" circle punch to get the rounded shape at the top.